The service says the crash that killed Troy Marden, a senior at Amesbury High School, occurred on Thompson Lake in Portland just before 11 p.m. on Saturday. The Maine Warden Service says it's investigating a fatal snowmobile crash that killed a 17-year-old from Amesbury, Massachusetts. It’s one of two fatal crashes that occurred over the weekend in Maine. 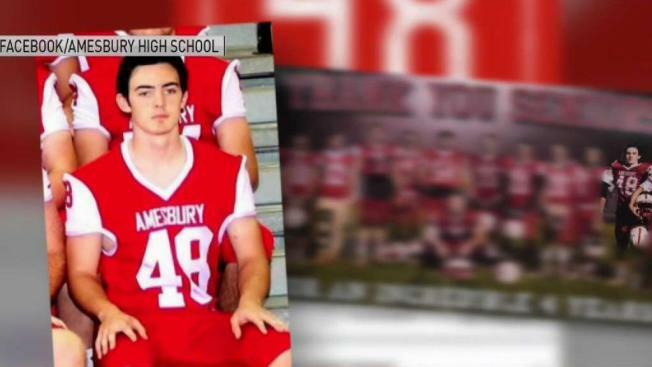 The service says the crash that killed Troy Marden, a senior and star football player at Amesbury High School, occurred on Thompson Lake in Portland just before 11 p.m. Saturday. The service says two snowmobiles were operating on a plowed portion of the lake when the snowmobile operated by Marden failed to negotiate a corner and hit a snowbank. Wardens say the operator of the other snowmobile tried to assist Marden before getting help. Marden was pronounced dead at the scene. His family is asking for privacy at this time but some people who knew him are remembering him as a "kind soul." Marden's football number 48 was honored on the school's Facebook page Sunday night, where photos highlighted his high school career. Classmates and parents left heartfelt condolences, as well as prayers for Marden's family. As the Amesbury High School community grieves, many are still in shock after being stunned by the news of his death. In a message sent to families in the Amesbury school district, Superintendent Jared Fulgoni called Marden's death a "tragic loss to our school community." "We are deeply saddened by our loss, and our thoughts and prayers are with Troy’s family and friends," the message read. Stating that Marden's death is sure to raise many emotions, concerns, and questions for the entire school community, Fulgoni says Amesbury Public Schools has a team of professionals prepared to help with the needs of students, parents, and school personnel. Counselors will be available Monday at the Amesbury High School cafeteria from 1 to 4 p.m. for anyone who needs support. The warden service is also investigating another snowmobile crash that resulted in a death on a Norway lake Saturday. The service says that crash killed 52-year-old Gracie Herrick Onofrio of Norway. The accident happened just after 3:30 p.m. on Pennesseewassee Lake. Wardens say a snowmobile hit the snowbanks of a plowed road on the lake, sending the vehicle airborne and throwing Onofrio from the snowmobile. A second snowmobile from the party then struck Onofrio, officials said. The service reminds all snowmobile operators to be mindful of their surroundings and manage their speed, especially with snowmobile traffic increasing during vacation week.